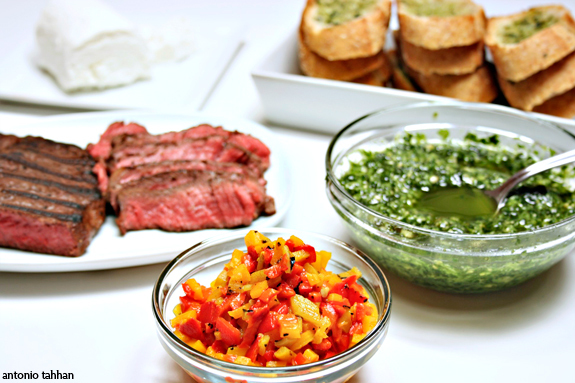 Posted in appetizers, Italian, recipe, savory by Antonio Tahhan on February 26th, 2009. You can follow any responses to this entry through the RSS 2.0 feed. You can leave a response, or trackback from your own site. Very classy Tony and very impressive! yup if daddy darling is paying then i prefer the hand massaged beef steak too! but i am with you – i buy my meat, poultry etc. from my organic store and make sure that there is nothing added to it except pure happiness! and i after tasting the difference i do not mind paying the extra few bucks. like these bites a lot tony. perfect for my dinner party this weekend! hugs! 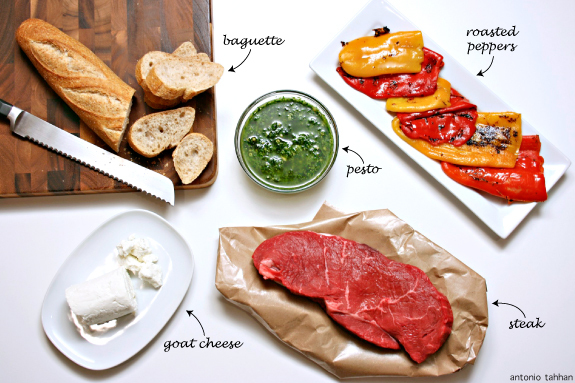 Tony, I can’t decide…roasted peppers or the steak…both are most satiating! So beautiful and appetizing! You’re a genius! I’m definitely making this one for my next party. Fabulous…how eye-catching & appealing that looks! I love happy cows. And this looks great! 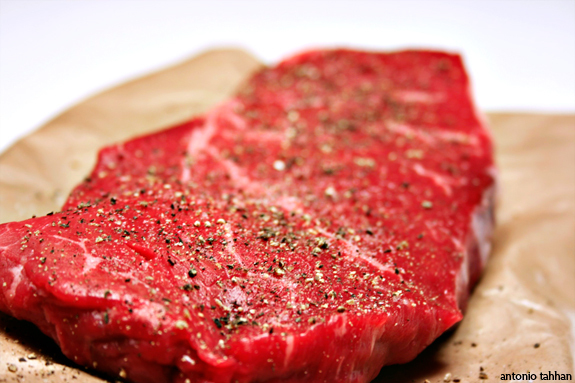 Nothin’ wrong with taking one expensive steak and stretching it between two people. We don’t need that much meat anyway! Beautiful job on the crostini. I wish I was in your kitchen when you were cooking that. I’d rather buy happy cows (and happy pigs!) 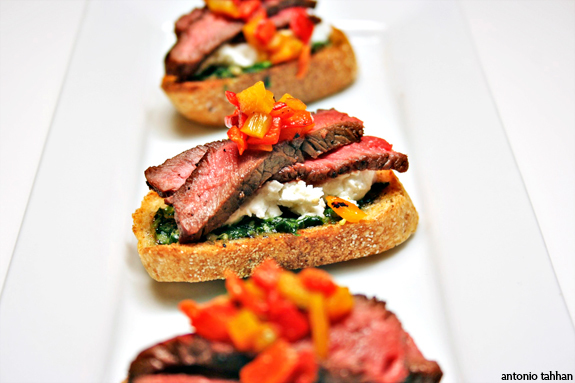 too…although the choices over here are not much and we are most often left to be satisfied with what we find in the supermarket 🙁 This steak crostini is such a awesome and delicious way to stretch a steak! MMM! Boy! This is good stuff!! Oh, that looks awesome! Very nicely done and I too have a fear of conventional meat. It tastes different and cooks differently. Luckily, we have some great ranches in Colorado. 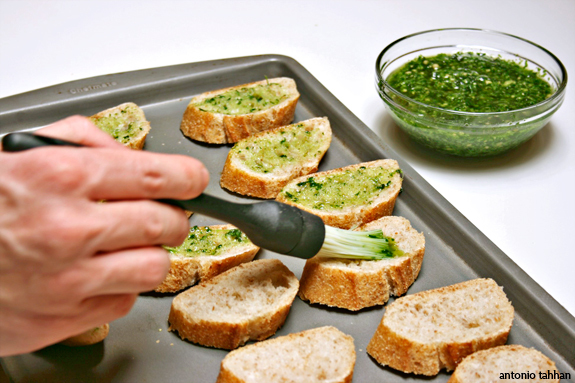 Love the addition of parsley to the pesto. I quite love the clean bite of that herb. That looks beyond incredible!! The flavors sound so good. I am definitely going to make this. Wonderful photos!! Thanks for sharing. I love these flavor combination’s, some of my favorites! Beautiful presentation! Awesome Tony! I actually came across this on FoodGawker (http://foodgawker.com/post/2009/02/27/17205/) and I clicked through because it looked so tasty! Nice work. Hope all is well with you. Wow, how beautiful are those. They look stunning and I’m going to make this next time I have a get together! Wonderful! those peppers are so vibrant! yay for happy (and healthy!) cows. i love these photos habibi – especially the last two!! I have tasted once kobe cows meat and there is nothing in the world better than that!!! Have heard about them? i could eat that whole staek if presented that way. those are stunning. 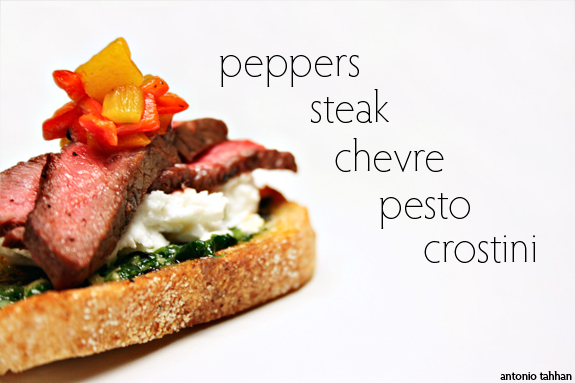 First of all, the steak crostini looks absolutely amazing! The pictures look fabolous! It’s funny you talking about the book Omnivore’s Dilema by Michael Pollen. Just this Sunday, I went to the library to see if I could check it out; I’d seen review on it. The library was closed, so I’ll have to make sure to get this Saturday. Like you, I am all for natural, organic meat. Although, I sometimes wonder how truthful the labels are. It sure is scary to eat flesh injected with hormones. Even though it’s more expensive, it’s worth it. For the sake of our health. That crostini looks good! With the steak it could even be a meal. Beautiful pictures, these looks so delicious. Wow, Tony, that is amazing!!! Gorgeous! What kind of a camera do you use?